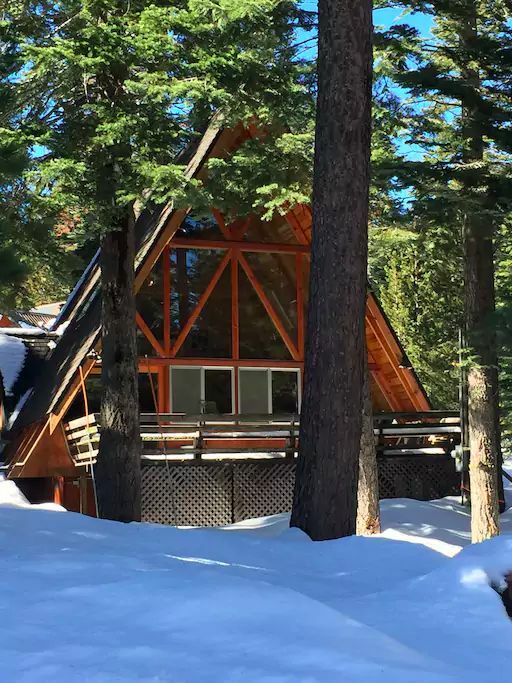 Tucked on the western shore of Lake Tahoe, this cabin is the perfect retreat for summer fun on the water, and chilly winter days alike. No matter what time of year this cabin's views are going to leave you in awe, and welcome you back after a day of adventuring with open arms. 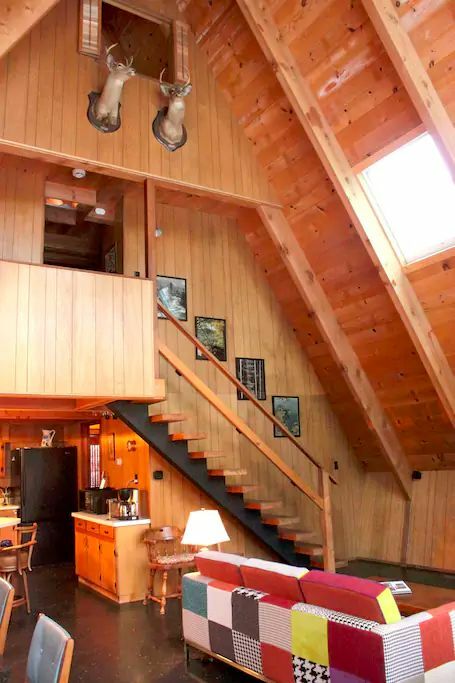 Inside you'll feel as though you're in a rustic chateau in the Alps with lofty beamed ceilings, knotty pine walls, gigantic windows, and taxidermied deer peering down as you cozy up next to the fire with a blanket and a good book. You might head here for a weekend away, but guaranteed you'll be wishing you extended your stay. The first impression you get from this cabin is how open it us. Despite warm wood walls, and rustic features, this space is airy and comfortable. We love how there's clear eyesight from almost everywhere in the home, meaning you can always be connected to your family and friends. 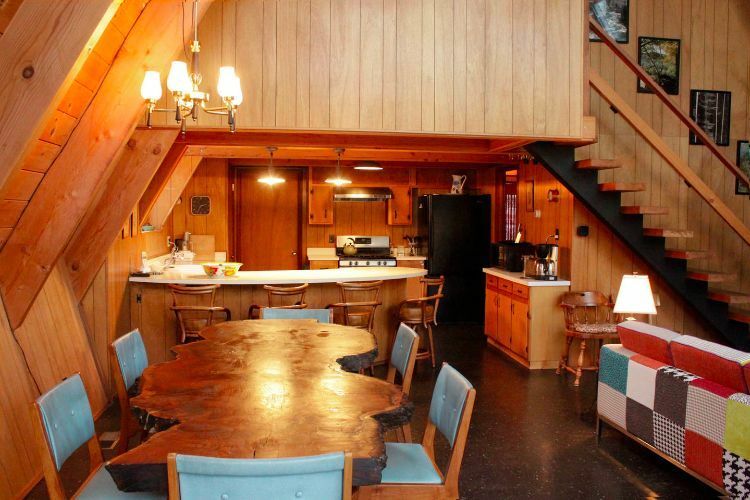 Plus, check out that incredible dining table. It is one massive slab of wood, lacquered on top yet with its bark still intact on the side. We adore this feature because it's just as memorable as the memories you're bound to make while sitting around it. 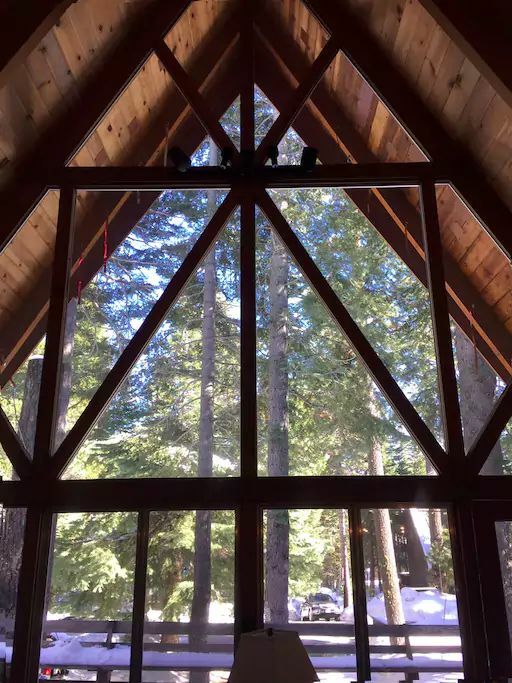 From here you can get a peek at the entire wall of windows that makes up the northern side of this cabin. The living space is tucked in the corner facing the wood burning fireplace, and those stunning views just past the porch. Now, if this isn't the perfect reading spot - we don't know what is. This chair is vintage, comfy, and stunning. 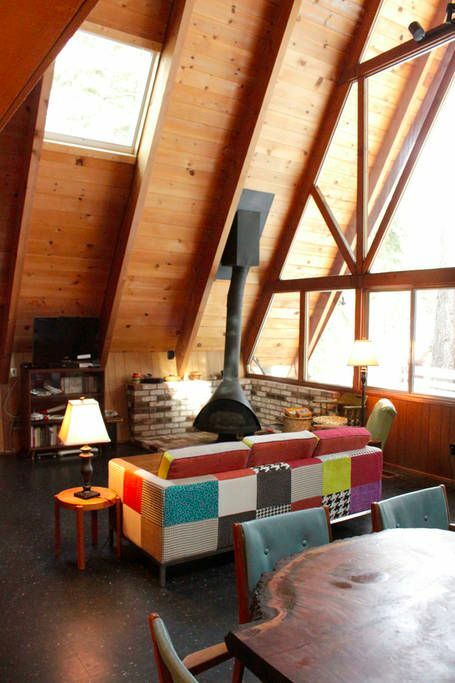 Plus, it's tucked right next to the fireplace so you can stay toasty while getting lost in the pages of your book. You might initially be in awe of these windows' size - but you'll soon get over that once you realize the view that awaits you just outside. Whether you're watching animals scurry by in the spring, or admiring snowflakes falling in the winter - you're always guaranteed a front seat to it all from the comfort of this cabin. At the end of the day, climb up these stunning stairs up into the loft bedrooms. The rest of the day you can sit back and admire the sheer height of the ceilings from the comfort of the couch. 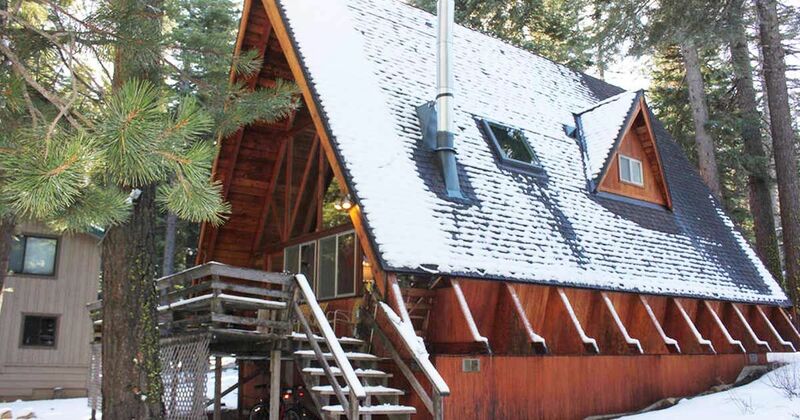 There're three bedrooms in this stunning cabin - two with queen sized beds and a kids loft that boasts 4 twin beds. 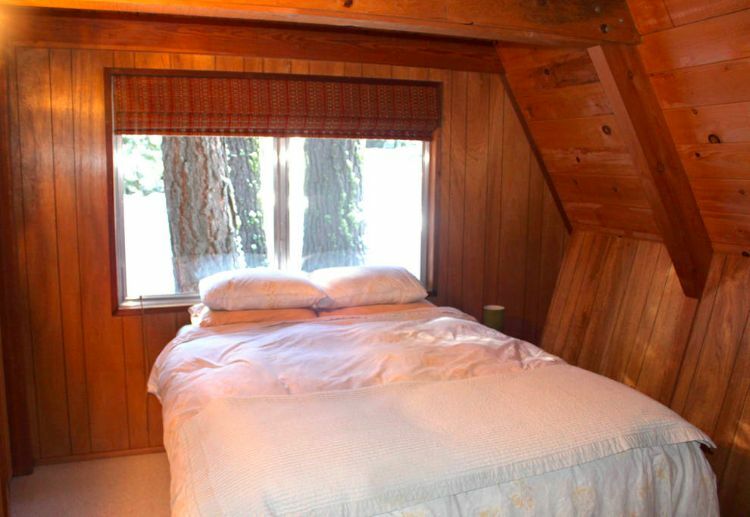 Each room is a great size, and has the comfy, cozy, cabin feel you want to come back to. This cabin is just as stunning from the outside as it is inside. After a day on the lake, or snowshoeing around the forest you'll trek back to this spot and admire your getaway. Not for too long though, because you'll be dying to get back inside. 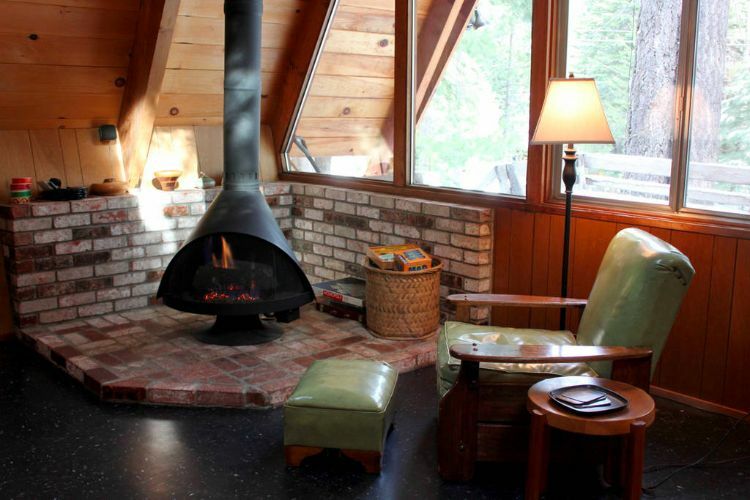 Share this incredible cabin retreat on Lake Tahoe with your friends on Facebook, Twitter, and Pinterest.